Last Interest Rate Rant of 2015 - I PROMISE!Last Interest Rate Rant of 2015 - I PROMISE! Last Interest Rate Rant of 2015 – I PROMISE! I promise this is the last time in 2015 that I will discuss interest rates and my strong belief that the Fed is making a big mistake by raising rates, which is expected to happen this week. Since a picture is worth a thousand words, then multiple pictures should be worth many thousands of words. Although I did something similar a few weeks ago by using charts to show why I thought the Fed is making a stupid mistake raising rates, let alone contemplating doing so, conditions have deteriorated even more since then that I thought it made sense to show some more pictorials and convey my rant this way. With interest rates at zero, it’s not easy to tell what the true effective federal funds rate is given it can’t go below zero. 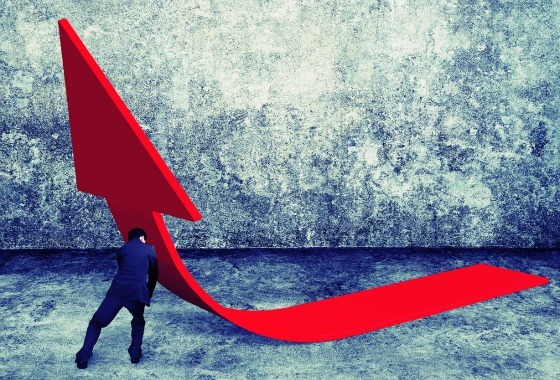 A couple of researchers, however, have been estimating the shadow rate to try to quantify if credit conditions are even looser by calculating if the effective Federal Funds rate is less than zero. 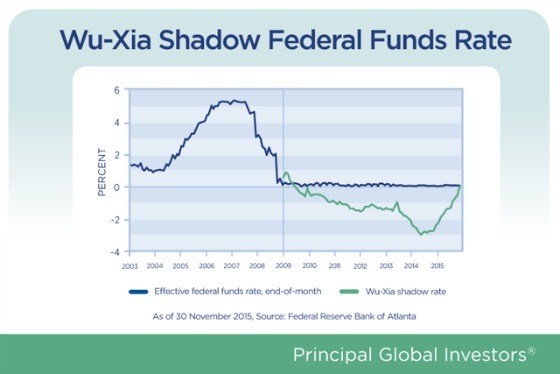 The following chart shows the trajectory of the shadow rate. It clearly shows that since late 2009, the effective Federal Funds rate has been negative and dropping. Until now. This chart shows that while rates have been negative on an effective basis, there has been a very significant tightening in the last 12 months to the tune of 300 basis points. 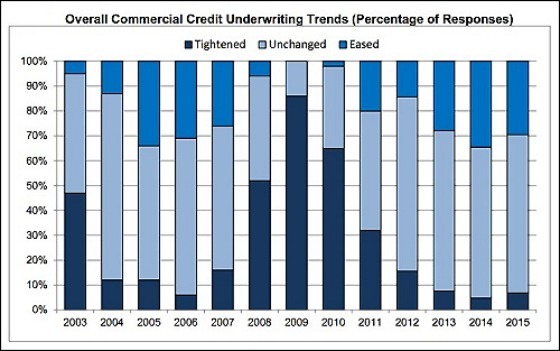 This is a very meaningful change and goes a long way to explaining the challenges we are seeing in corporate credit. The next chart shows how the Fed typically increases the Federal Funds rate when global liquidity is rather loose. 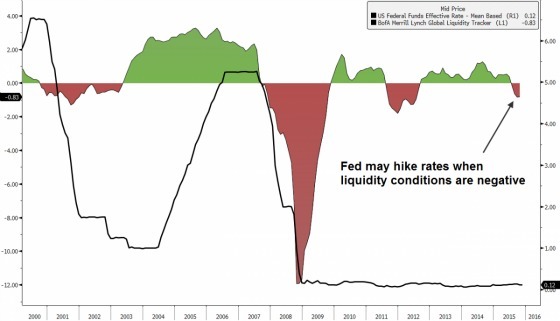 This is no longer the case as liquidity conditions have turned negative according to Bank of America Merrill Lynch via Seeking Alpha. Surveys can often times reflect what has been taking place in the rearview mirror versus where things are headed. The next chart shows that credit conditions have been perceived to be very borrower friendly. My hunch is that this will turn in the other direction quite sharply soon. This chart is courtesy of @soberlook. With the collapse in commodity prices, particularly oil, leveraged loans and high yield loans are getting crushed with the pain spreading beyond the energy sector. 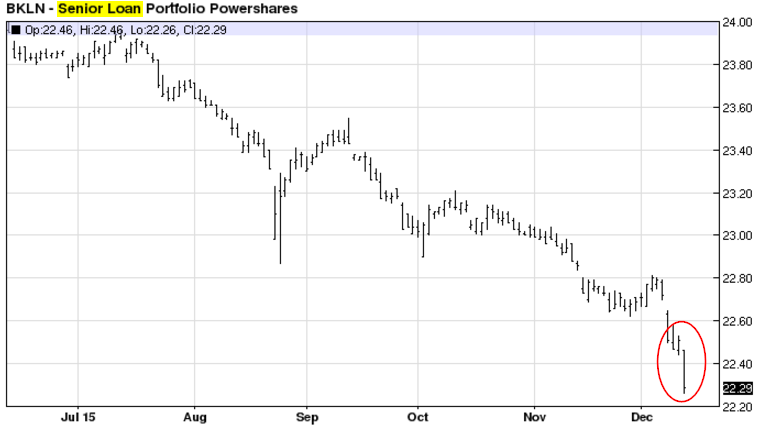 The following two charts from @soberlook depict this quite dramatically. 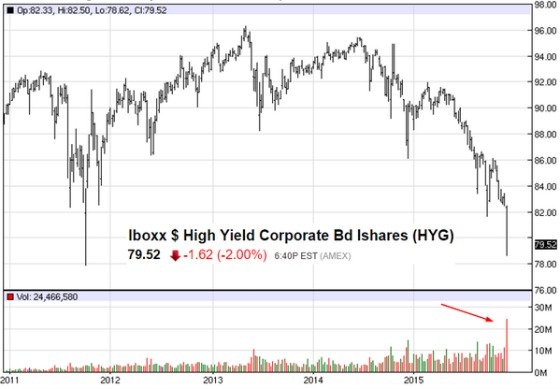 The second chart shows the significantly heightened trading activity that is taking place in the junk bond space. These are pretty significant losses for bond investments, albeit risky ones. And now we are seeing 2007-like repercussions when Bear Stearns and BNP Paribas closed the gate on some of their funds which were some of the earliest canaries in the coal mine that things were not so rosy in the world of corporate credit. We all know what happened after that as the global financial system almost imploded choking on toxic mortgage paper. Could we have a similar canary in the coal mine with the recent announcement by Third Avenue Management shocking the high yield world by barring redemptions from its high yield mutual fund so it can try and carry out an orderly liquidation? I would not rule that out. The pain has also now spread to the hedge fund world as well with the announcement on Saturday by Stone Lion Capital Partners that they are not letting investors withdraw funds from its credit hedge funds as too many investors asked for their money back. Ironically, the fund is run by two ex-Bear Stearns traders. 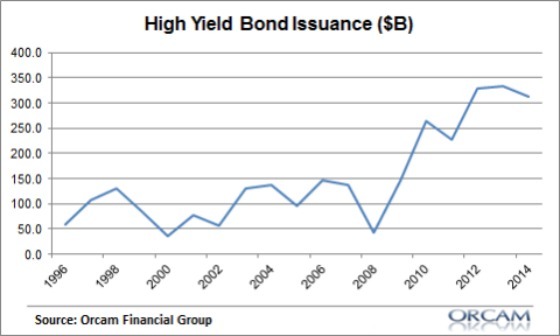 This is problematic because as the following chart shows from Pragmatic Capitalism, high yield bond issuance has dwarfed what was originated in the pre-2007 era. Back then mortgages were the culprit while today it looks like it might be high yield. 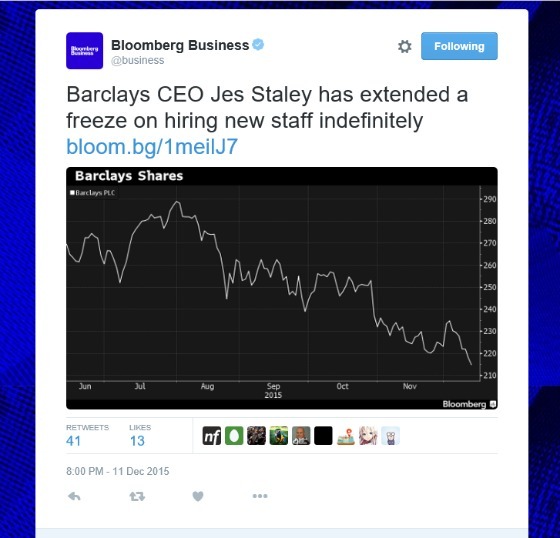 And now the pain is spreading to Wall Street as Barclay’s has announced a hiring freeze as this @soberlook tweet shows. Fasten your seatbelts folks. This should be a very interesting week and 2016. You’ve seen the charts, you’ve read my blog(s), in case you missed it here’s my other interest rate blog What do you think? Let me know in the comments below.